We live in an age where determining if a woman is pregnant is ridiculously simple and cheap. Go back a few decades, though, and the latest and greatest technology for determining whether a woman was with child involved a syringe full of urine and little animals. Yes, as bizarre as it’s going to sound, you really can use things like rabbits (or a number of other animals) to detect whether a woman is pregnant. To be clear, this isn’t just an old wives’ tale that’s only correct just enough to keep people believing it via confirmation bias or something like that, “The Rabbit Test”, as it is aptly known, is around 98.9% accurate (for reference, modern home pregnancy tests tend to range from 97%-99% in accuracy). Some version of this test has been the de facto way to test whether a woman was pregnant from the time the method was discovered in 1927, right up until the 1970s. The only real improvement made in that time being that, instead of a rabbit, later doctors used a specific species of frog, for reasons we’ll get to in a minute. In a nutshell, the rabbit test involved taking the urine of a woman who suspected she was pregnant and injecting it into a juvenile female rabbit. The importance of using a juvenile rabbit was that if the woman was pregnant, the rabbit would prematurely enter heat, which the doctor would be able to determine by checking its ovaries for certain signs, such as being enlarged with visible red dots on the surface. 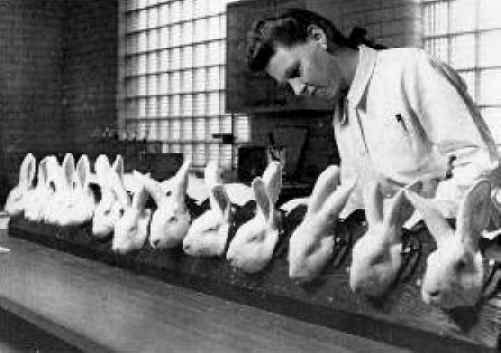 This was a process that for the early days of the procedure unfortunately meant that the rabbit had to be killed, leading to a popular misnomer, and expression, that a woman would only be pregnant if “the rabbit died”; but in reality, the rabbit always died. In time, the test and science advanced enough for the doctor to be able to check whether the rabbit had an estrous reaction without killing it, much to the relief of cute little fluffy bunnies everywhere. Another significant improvement was the realisation that the experiment could be performed on a frog (specifically an African Clawed Frog) with similar accuracy. This circumvented animal murder entirely, since all the doctor had to do in this case was wait to see if the juvenile frog laid eggs within 24 hours of being injected with the urine. At this point you might be wondering how this sorcery works. Back to the rabbit test. This was invented in the late 1920s by Selmar Aschheim and Bernhard Zondek, a German gynecologist and endocrinologist respectively. 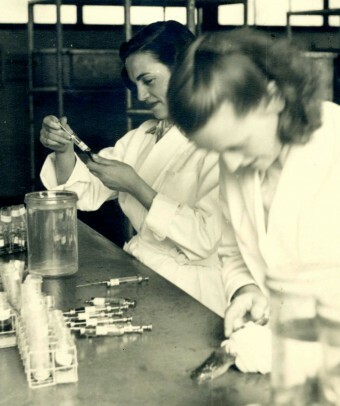 Zondek, an expert in hormone research, discovered and isolated the hCG hormone while working alongside Aschheim, studying the urine of pregnant women in 1927. Noting that the hormone was (seemingly) only found in the urine of pregnant women (the fact that the hormone could be produced by testicular tumors, among others, was discovered a few years later), the pair correctly theorised that it was intimately linked with being pregnant, though they were never able to pinpoint where exactly it was produced, incorrectly proposing that it was produced by the anterior pituitary gland, rather than the placenta. After isolating the hormone, the men began experimenting with it to see what effect, if any, it would have on mice and rats. To their amazement, they discovered that it caused female rodents to begin ovulating, even if they hadn’t yet reached sexual maturity. How revolutionary this was cannot be overstated. Prior to Aschheim and Zondek’s discovery, there was no reliable way for a woman in her first trimester to definitively know whether or not she was pregnant, with one of the leading “tests” through the ages using uroscopy- studying the colour and consistency of a woman’s urine, with the practitioners colloquially called “piss prophets”. Another interesting urine based method was dipping a ribbon in the urine and then burning it to study the smoke and the flame’s colouration. A notable exception to the various questionable methods of confirming pregnancy throughout history is an ancient Egyptian test dated to at least 1350 BC that involved urinating on a sack of wheat and barley seeds over the course of a week, and then checking to see if they sprouted. (We can only imagine how they came up with this.) If the seeds did sprout, the woman was determined to be pregnant. If not, probably not. While this may seem bizarre and more than a little ridiculous, said test was found to be 70% accurate under laboratory conditions in 1963. It is theorised that the presence of high levels of estrogen in the urine of pregnant women is the trigger here. By 1928, Aschheim and Zondek had perfected their rabbit test, dubbing it the A-Z test, as a nod to both of their names, and for the first time in all of human history, except for in Ancient Egypt, women who suspected they might be pregnant had a way to relatively quickly find out for sure. As for why rabbits were chosen over the aforementioned mice, this had less to do with the rabbit version of the test being more accurate and more to do with the fact that the rabbits were easier to handle. At around the same time the A-Z tests were making their debut, a British zoologist residing in Cape Town, South Africa, Lancelot Hogben, independently discovered that the African clawed frog would begin ovulating and producing eggs when its dorsal lymph sac was injected with certain hormones from sheep. Hogben repeated the test with urine from a pregnant woman and noted that the frogs would similarly ovulate and lay eggs shortly after being injected, making them a reliable indicator for pregnancy. (It was later discovered injecting adolescent male frogs also worked, except in this case it simply spurred sperm production.) The actual methodology of the test was later refined by South African researchers called Hillel Abbe Shapiro and Harry Zwarenstein, with the result being a pregnancy test that was every bit as accurate as the A-Z test. Though Hogben’s discovery was made at around the same time as Aschheim and Zondek’s in the late 1920s and was both more humane and faster, giving reliable results in less than a day instead of around 72 hours like the A-Z test, the Hogben test didn’t become popular until the mid-1930s, at which point it became the gold standard for detecting pregnancy. While other methods were developed in the ensuing decades, the Hogben test remained one of the most accurate and popular ways to detect pregnancy right up until the early 1970s. Thank you for your report on the pregnancy test on Mrs. X. You may be interested to know that of one GP of many years’ standing, one specialist gynaecologist and one frog, only the frog was correct. We like to imagine that after correctly overruling her more credentialed colleagues, they gave the frog a tiny doctor’s coat. If you’re wondering why rabbits are considered such prolific breeders, it has less to do with them getting it on more than many other animals, necessarily, and more to do with the time frames involved in the process of producing new rabbits. A baby rabbit becomes sexually mature in an average of just about 5-6 months, and sometimes even sooner. They can potentially live up to around 10 years. 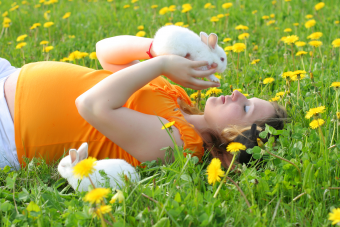 Further, it takes only around a month from the point of getting pregnant for a female rabbit to give birth. Their litters can include as many as a dozen rabbits! What makes this even more astounding is that the female rabbit can get pregnant as soon as the next day after giving birth. Rabbits are induced ovulators, so the females are pretty much ready to get pregnant anytime they mate (assuming they aren’t already pregnant), with the mating triggering the ovulation. So even just a single female can give birth to several dozen baby rabbits per year. Given this, combined with the fact that the babies are ready to make babies at the stage when most human offspring are still mostly just poop and drool factories, you can see how rabbits got this reputation. 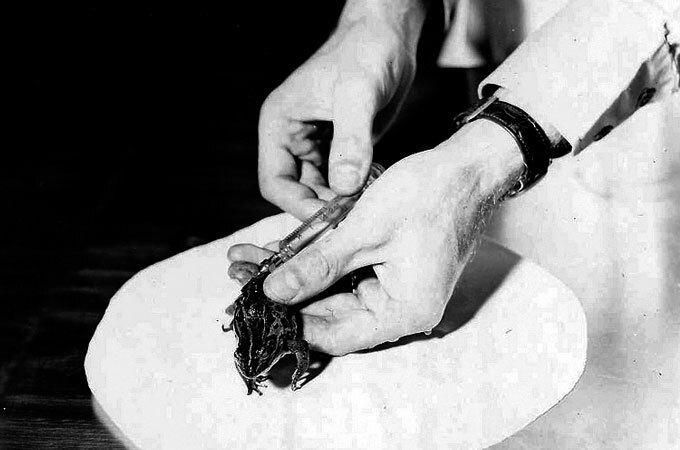 The widespread popularity of the frog test is thought to have unintentionally wiped out many species of frog in North America due to a Batrachochytrium dendrobatidis fungal disease called chytridiomycosis that was accidentally imported with the African frogs. The word, “visionary,” almost always has a positive connotation. In this context, it ought not to have been used without qualification. The writer should have made it clear that G. Jones was seen as “visionary” only by proponents of in-vitro fertilization [IVF]. The truth is that, for solid and often convincing reasons, millions of people all over the world have rejected IVF, having come to the conclusion that it is a very bad thing for mankind. Even more important than the fact that this is an asinine statement [using a toddler’s terminology instead of an adult’s vocabulary], it is totally inappropriate because it is demeaning to a portion of the human population. NO person, regardless of how young or old he/she is, should ever be referred to as a “mostly just [a] poop and droop factor[y].” This kind of dehumanization of persons is what leads to some of man’s greatest crimes (e.g., slavery, the Nazi holocausts, “ethnic cleansings,” internment camps, abortion, etc.). All writers at this site must speak of all people — even criminals, the terminally ill, preborn babies, etc. — with equal respect. Mr. J. F. Gecik — let’s examine three flaws from your comment, shall we? First: “from the standpoint of being informative” — isn’t that, in a nutshell, what this website does? I mean, honestly — to incite riot over the use of semantics seems to be a bit far-fetched, eh? Secondly, let’s address this quote: “The word ‘visionary’ almost always has a positive connotation” — and the best baseball players in the world “almost always” record an out at the plate. Six of one, half a dozen of the other. Trying to argue with that kind of logic won’t ever get you very far. Also, don’t try and point out perceived flaws as clearly black and white errors, then back up your “almost always” statement with a subjective retort: “millions of people all over the world have rejected IVF, having come to the conclusion that it is a very bad thing for mankind.” I’m sure I’m using the same source as you did for your reference here — but, there have been millions of people who have come to the conclusion that using IVF as a way to conceive is a great thing for those who have issues naturally conceiving. Third and lastly, I’m not sure if you’ve ever had a child, Mr. Gecik — but to say that a 6 month old is a “poop and drool factory” is very accurate, and I apologize if the humor was lost on you. Clearly a child is much more than that, as I could and would go on and on about my 2 year old, but it seems as if you are attempting to fight yet another Gecik-created battle here. Don’t create the war, choose the side for your opponent, then berate them for the position that you’ve created — that’s assinine (spelling error intended, as I hope the humor isn’t lost on you again). (1) So, by that logic, one could not apply “visionary” to Albert Einstein? I mean, Nuclear weapons are bad for mankind, so his involvement with them should make “visionary” not apply to him… Really what you meant to say is that you have been instructed to revile Georgeanna Seegar Jones because you personally believe, based on your faith, that if an embryo dies it is a sin. To do otherwise would soften you stance on abortion. (2) If you had made just this one comment, I would have thought you were a little overzealous with your PC attitude. After the previous comment, I sense the same motivation. You seek to use the language of political correctness (itself a dubious notion) to reinforce your own politico-religious viewpoint. Making a joke that babies are mostly just drool and poop factories is not offensive to anyone. The use of juvenile language was the thing that indicated it was a jest. And no, Virginia, abortion does NOT belong on that particular list of crimes. Whether it is right or wrong is not for me to say, but clearly a woman who has aborted one fetus is not going to eclipse Stalin or Hitler any time soon. Then, you go on to tell the staff of this website what they MUST do, now that you have used your first two comments to put yourself on the perceieved moral high ground. “Pre-born babies” are commonly referred to as fetuses. I am not about to suggest that anyone should DISRESPECT anyone else, but simple human decency and kindness should be enough. And you know what? I don’t necessarily “respect” criminals. The Orlando gunman? Not really on my “Respect” list. Boston Marathon bombers, the same. Criminals should be treated fairly, and decently, with regard to their human rights; but that has very little to do with respect for them, and everything to do with the self-respect we should have for our own society. @The Author: Informative article, keep up the good work. Not defending Gecik, but Einstein developed a theory that had little to do with the bomb. Visionary Atomic Bomb designer? I might balk at that. iHF doesn’t require a religious base to reject. If you want a child, there are millions of unwanted ones, why “manufacture” one when those kids need a home? “Fetus” is one stage of a baby’s development. It’s PC to call a fully formed human a fetus after a certain point. One woman, probably not on par with Stalin or Hitler, but 3 millions babies killed a year? That’s a holocaust; again, you don’t need to be religious to feel that way. Clearly at least one person was offended, so “any one” is incorrectly used. Didn’t bother me, but it clearly did Gecik. Personally, I think the writers of this site are more than welcome to write what and how they want. I learned some of this 15 years ago, when my brother, then a high school senior, left a message for my mom on the kitchen table: ‘I’m going to [girlfriend]’s house. The rabbit died. I might be there late.’ Cue my mother flipping out and rushing over to the girl’s house, pounding on the door, thinking my brother knocked her up. Her parents, about the same age as my mom (60 now) were kind of amused when they realized what my brother wrote, and the whole situation. And that, folks, is the story of my mother nearly stroking out, my brother getting a super awkward talk about the need for proper protection (since, yeah, the door was opened for it, so my mom just plowed ahead into that conversation with him, the girl, and her mother and father sitting there! ), and how the lyric ‘Can’t catch me ’cause the rabbit done died’ from Sweet Emotion finally made sense to me (once my mom called me at college to tell me the whole epic tale — and to make sure i was using protection up in college too, since she was on a roll! ).